The radius bone is the lateral [on side of thumb] and slightly shorter of the two forearm bones. It rotates to produce the motion supination and pronation of the forearm. These movements are essential to many everyday tasks such as writing, drawing, and throwing a ball. The radius pivots around the ulna to produce movement at the proximal and distal radio-ulnar joints. That means radius moves around the ulna to produce the movement. The radius is a typical long bone made of compact bone with a hollow center and spongy bones filling the ends. At the proximal and distal end of the radius, the compact bone is reinforced by thin columns of spongy bone that give the radius extra strength without significantly adding to its mass. The outer surface of the radius is covered in a thin layer of fibrous connective tissue known as the periosteum. The articular part is covered with hyaline cartilage. It forms the radiocaptellar joint by an articulation between the head of the radius, and the capitellum of the humerus. An articulation between the radial head, and the radial notch of the ulna. The joint is formed by the distal end of the radius and the carpal bones. An articulation between the ulnar notch and the head of the ulna. The radius is the lateral bone of the forearm and is homologous with the tibia of the lower limb. Radius along with ulna connects the elbow to the forearm. It has an upper end, a lower end, and a shaft. The topmost part of the radius is disc-shaped and is called the head of the radius. It is covered with hyaline cartilage. It has a superior concave surface which articulates with the capitellum of the humerus at the elbow joint. The head continues below as neck which is enclosed by the narrow lower margin of the annular ligament. The head and neck are free from capsular attachment and can rotate freely within the socket. A bony prominence called tuberosity of radius lies just below the medial part of the neck. It has a rough posterior part and a smooth anterior part. It provides attachment to the biceps tendon. Distal to the elbow, the body of the radius continues in a straight line along the lateral side of the forearm before suddenly widening just above the wrist joint. The radial shaft expands in diameter as it moves distally. Much like the ulna, it is triangular in shape, with three borders and three surfaces. In the middle of the lateral surface, there is a small roughening for the attachment of the pronator teres muscle. It has three borders and three surfaces. 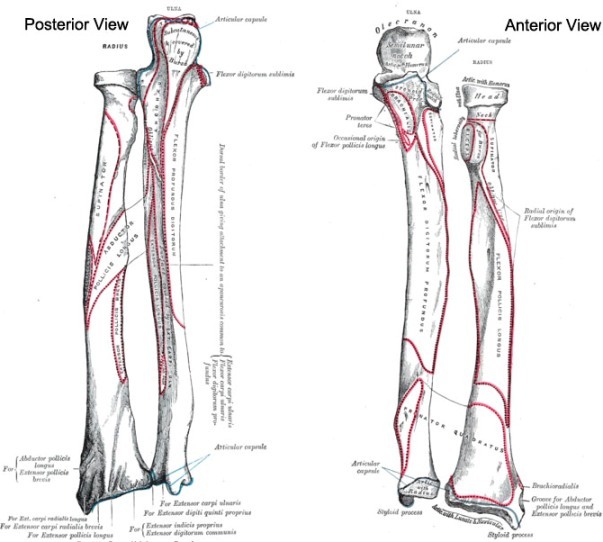 The anterior border extends from the anterior margin of the radial tuberosity to the styloid process. It is oblique in the upper half of the shaft, and vertical in the lower half. The oblique part is called the anterior oblique line. The lower vertical part is crest-like. The posterior border is clearly defined only in its middle one third. The upper oblique part is known as the posterior oblique line. The medial (or interosseus) border is the sharpest of the three borders. It extends from the radial tuberosity to the posterior margin of the ulnar notch. The interosseous membrane is attached to its lower three fourths. The anterior surface lies between the anterior and interosseus borders. It carries a nutrient foramen directed upwards which is for nutrient artery, a branch of the anterior interosseous artery. The posterior surface lies between the posterior and interosseus borders. The lateral surface lies between the anterior and posterior borders. In its distal part, the radial shaft expands to form a rectangular end. The lateral side projects distally as the styloid process. In the medial surface, there is a concavity, called the ulnar notch, which articulates with the head of the ulna, forming the distal radioulnar joint. The distal surface of the radius has two facets, for articulation with the scaphoid and lunate carpal bones. This makes up the wrist joint. The biceps brachii is inserted into the rough posterior part of the radial tuberosity. The anterior part of the tuberosity is covered by a bursa. The quadrate ligament is attached to the medial part of the neck. The oblique cord is attached on the medial side just below the radial tuberosity. Supinator is inserted into the upper part of the lateral surface pronator teres on the middle of the lateral surface. The radial head of the flexor digitorum superficialis originates from the anterior of the oblique line (upper part of the anterior border). The flexor policis longus takes origin from the upper two thirds of the anterior surface. The brachioradialis inserts on the lowest part of the lateral surface just above the styloid process. The pronator quadratus is inserted into the lower part of the anterior surface and into the triangular area on the medial side of the lower end. The articular capsule of the wrist joint is attached to the anterior and posterior margins of the inferior articular surface. The extensor retinaculum is attached to the lower part of the anterior border. The interosseus membrane is attached to the lower three fourths of the interosseus border. The radius ossifies from three centers: one for the body, and one for either end. The center for body makes its appearance near the center of the bone, during the eighth week of fetal life. Ossification commences in the lower end between 9 and 26 months of age. At around five years of age, the cartilage on the proximal end of the radius near the elbow ossifies to form the proximal epiphysis. This is the most precise site about bones that I have come across so far. Thank u 4 helping me do my assignment perfectly. This site rocks! im telling my friends about it for our school project! !